The Theobroma Chocolate Lounge is on Little Stanley Street, near the South Bank parklands, making it the perfect spot for a romantic dinner for two after an evening stroll through the park. 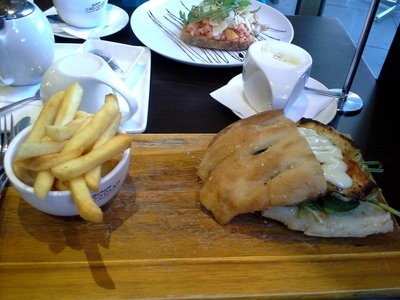 The food was wonderful and the service was prompt and very friendly. Unlike many dessert bars, Theobroma also serves main courses, so you can order a meal there before you start on the chocolate. Or not, if you just want to go all out for a cocoa overdose. 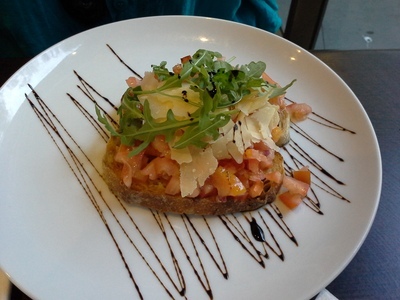 I ordered the bruschetta with tomato and shaved parmasan and found it quite tasty. My husband had the grilled chicken sandwich on Turkish bread, which he enjoyed. They were both pretty light meals but that was what we were going for since we planned to fill up on chocolate. 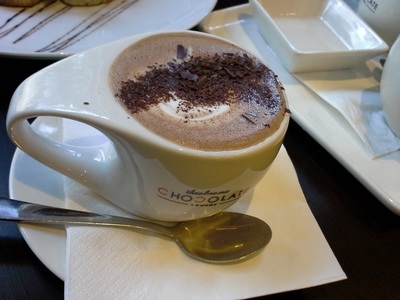 The hot chocolate came in light, dark, caramel, mint, hazelnut or chilli. We tried the dark and the white. 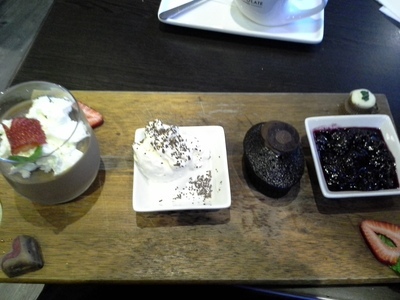 Both were served in mugs with frothy milk and chocolate shavings on top. The dark was quite sweet for dark chocolate and not as strong as I like it. The white hot chocolate was divine and tasted slightly of vanilla. We followed our main course with the dessert platter for two. There were two little handmade chocolates, which can be bought individually in store, a mini mudcake, some berry compote, vanilla ice cream with chocolate sprinkles and a bowl of chocolate mousse. The chocolates were a Christmas pudding flavoured one and a berry filled heart. It was all good, but the mousse really stood out for its perfect taste and texture. It is made in house and tastes like it. One thing that really makes the Theobroma Chocolate Lounge stand out from some other dessert bars in Brisbane was the service. The staff were really friendly and helpful, repeatedly checking whether the food was all right, whether we needed anything etc. and the food arrived very quickly. I would recommend the Theobroma Chocolate Lounge for a light meal or a chocolatey treat at any time of day. They also have lounges in many other Australian cities as well as New Zealand, Malasia, the UK, the USA, Sinagapore and Saudi Arabia.